Learning Latin is something I really want my children to do for so many reasons. We’ve been blessed to try many programs in the past but none really stuck with us. I was thrilled when we were given the chance to try Picta Dicta Vocabulary Builder from Roman Roads Media. I’ll just cut to the chase and tell you all, we love this program. Picta Dicta Vocabulary Builder is a Latin grammar and vocabulary builder that packs a serious punch. There is so much material in every very short session that it’s pretty amazing. Here is the kicker, while that sounds overwhelming its actually marvelous. My 3 oldest children (ages 8, 10, and 12) learn so much in their short little lessons I’m constantly astounded. While this program is really intended for about middle school through adult it really has proven beneficial even for my 8-year-old daughter Joyanna. The program is very interactive. Each student should be given their own account and log-in so progress can be tracked separately and you can choose individual difficulty levels. In the lessons, your child will learn about verbs, adjectives, prepositions, and nouns for over 1,000 words. This program takes an integrative approach with visual cues like pictures, auditory cues through sounds, definitions, etc. In “Spell” your student will be presented with a picture from their vocabulary words and they’ll need to spell that Latin word by typing on the keyboard. In “Forms” the student will give the plural forms of the words, the gender, and case. In “Test Forms” your student will do what they previously did in “Forms” but not this is the test. What Do We Think of This Program? Well, as I stated early on, we LOVE it. While my oldest two boys are getting the most out of it they are in the intended range, my 8-year-old can’t be left behind. I knew we had something special the day the three of them came to the dinner table spouting off random Latin words for the fun of it. They clearly knew what they were saying, and it was all a lot of funny to them. My husband’s eyes about popped out of his head. So did mine for that matter. We saw immediate success with this program and that is such a big deal. I allow them to work each day for just 10-15 minutes and they appreciate the short lessons. The program is interesting to them and holds their attention well for that long, and sometimes longer. I have a lot of confidence that over time this program will help them gain confidence in Latin and foreign languages in general. I see this as a great starting point for future language study. Overall we are big fans and look forward to working through this program a bit at a time every day. 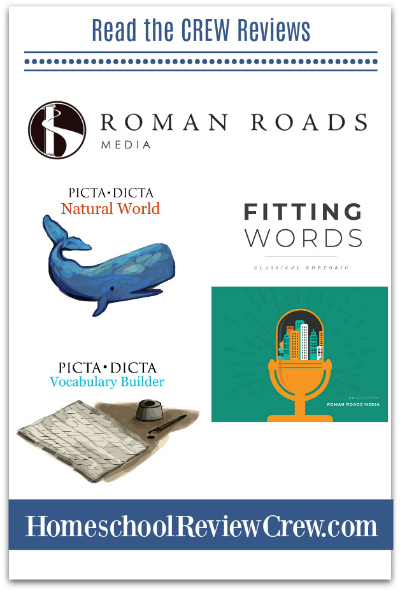 To learn more about Roman Roads Media and the other programs they offer, to see what other reviewers had to say about Picta Dicta Vocabulary builder please click the banner below.